Why Be A Quaker ? “You will say, Christ saith this, and the apostles say this; but what canst thou say? Art thou a child of light and hast walked in the light, and that which thou speakest is it inwardly from God? This is the website of the Hastings (England) Meeting of the Religious Society of Friends. 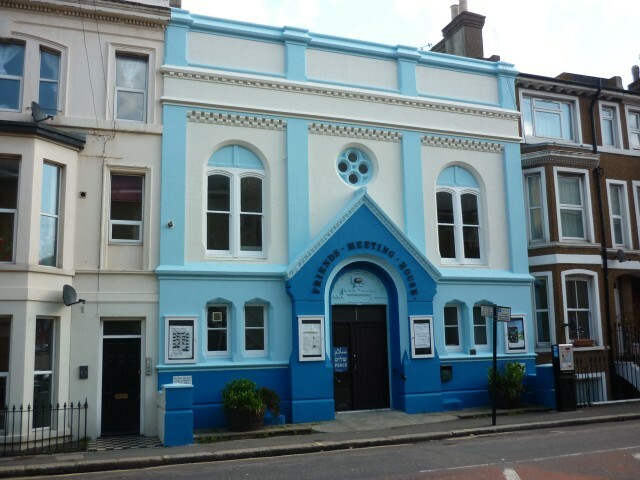 Quakers have been meeting together in Hastings since the 1670s but it was only in 1865 that we finally acquired our own purpose-built Meeting House which is the one still in use today, situated in South Terrace in the town centre (see picture above) and in January 2016 we celebrated the 150th anniversary of the first Meeting for Worship held there. Hastings Quakers meet for Worship every Sunday at 10.30 am in the Meeting House at 5 South Terrace, Hastings TN34 1SA (80 yards from the junction with Queens Road). If you would like to find out more about Quakerism, have a look at the page called “Introduction” . If you have had some contact with Quakers or if you have been reading about us and have been puzzled by some of the terms and phrases that we use, the page called “Language” will hopefully make everything clear! Be aware though that everything you read here is just one Quaker’s view. It is a view from the inside, and hopefully an accurate and an informed one, but it is not and cannot be in any way “definitive” or “official”. There are also links to other pages which may be of interest. If you are a Quaker from another town coming to Hastings on holiday or for a visit, you may be looking for information on how to find the local Quaker meeting, and perhaps wanting to read something about Hastings generally. There is also a link to the page called “Our Town” which will tell you about Hastings, past and present. There is also a page mainly for the benefit of local Quakers with a “calendar” listing the various events and activities we have coming up over the next few weeks. To access this calendar, click on the Tab marked “Calendar” at the top of this page. You are welcome to join us for Worship: you do not have to be a Member, or to make any formal request or arrangement. Nobody will expect any commitment or make any demands on you: just come along, and see how you like it. That is how many of us started! The Meeting House has a sloping ramp at the entrance to try to facilitate access for wheelchair-users. Inside and to the left there is a specially designed toilet for the disabled which is reached by means of a short corridor 31 inches wide. We welcome children to our Meetings. Generally we suggest they stay with the adults for the first 15 minutes or so, just so that they know where the rest of us are and have some idea what we do. Then since an hour can be a long time to expect them to sit still, we have a separate, smaller room upstairs where there are various activities and resources to entertain them until they rejoin us at the end of our Meeting for Worship. We have qualified helpers to accompany them, but if this is their first visit or if they have not come very often, it would be better if a parent or carer with whom they are already familiar could also stay with them during this time. Older children or those who are more familiar with the Meeting may not require this. If you are expecting to attend with a child it would be useful if you could let us know in advance so that we can ensure that appropriate arrangements are in place. Many local groups and organisations also hire the Meeting House during the week for their own meetings and activities. The cost for hiring the main room on the ground floor is £20 for a three-hour period, and there is also a smaller “committee room” upstairs available for £10 per session. There are kitchen facilities and a specially adapted disabled persons’ W.C. QUESTIONS ABOUT QUAKERISM or HASTINGS QUAKER MEETING ? You may also use that address to send a request to receive the editor’s 12 part e-mail course on “basic Quakerism” free of charge. And now, if you are in the mood for something a little out of the ordinary . . .
here is a chance to try your hand at Esperanto, the International Language. It is more than just a language, though: at the heart of the philosophy behind Esperanto lie the core Quaker values of Peace and Equality, and while Esperanto was not a Quaker initiative as such, the fact that it shares these same values and principles mean that it is aligned in a very similar direction. In fact some of its most respected practitioners have been Quakers, such as the Swiss historian and peace activist Edmond Privat, and the English librarian and music-teacher Montagu Butler. To find out what exactly Esperanto is, and why it should be of particular interest to Quakers, click on the tab at the top of this page marked “Why Esperanto?” You can e-mail the editor of this website on hastqua@gmail.com with any questions about Esperanto or how to begin learning it, or how to meet other Esperanto speakers at our various events and gatherings. Now, if you are feeling sufficiently adventurous, you can try reading an abbreviated version of this page (and also a few of the other pages from this website) in Esperanto. Either click on the Green Star below or on the tab called “Hejmo” (which means “Home”) at the top of the page.